October 30, 2014 - Nashville, Tenn. - Winter Jam Tour Spectacular 2015 kicked off its 20th anniversary year at a launch party earlier this week in Nashville, Tennessee. Of the ten artists slated for the East Coast run, which begins January 2 in Charleston, West Virginia, seven are from Word Entertainment. Skillet reprises their role as tour headliner, joining label mates for KING & COUNTRY, Family Force 5 and Blanca, as well as Francesca Battistelli, About A Mile, Everfound and Veridia who are also part of the West Coast run, launching November 6. For the past seven years, Word Entertainment has been well-represented on Winter Jam, particularly on the Pre-Jam Party, which has served as a showcase for new bands. Over the years, artists like for KING & COUNTRY, Everfound, Love & The Outcome, Jason Castro, Sidewalk Prophets and many more have cut their teeth as part of the Winter Jam Pre-Jam Party. In 2015, that now 8-year partnership comes full-circle. "We are thankful for the eight years we have partnered with Winter Jam on the Pre-Jam Party," says Rod Riley, President and CEO of Word Entertainment. "This year is a phenomenal example of that relationship with Francesca Battistelli and for KING & COUNTRY having started their Winter Jam relationship on the Pre-Jam Party and are now returning to join the tour." Founded in 1985 by Newsong, Winter Jam has been the #1 tour in the world (first quarter) for four consecutive years. The structure and success has remained largely unduplicated, making it an experience unto its own for both concert-goers and artists. "Winter Jam is such a unique and powerful platform for our artists as it is a tour that brings together 500,000 fans who are passionate about the power of Christian music and ten bands that get to bond with each other from coast to coast," says Riley. Francesca Battistelli echoed that sentiment, sharing that she was "excited to be a part of Winter Jam for the third time." Pastor Tony Nolan, who is returning as the Winter Jam Pastor referred to the camaraderie on and off-stage as "a kind-of family." New artists, Veridia, said they were, "overwhelmed and so excited to be a part of Winter Jam." Russ Lee, founding member of Newsong and Winter Jam, stated that he's blown away year after year by "the diversity of artists on this tour. There's nothing else like it. It's God's tour." 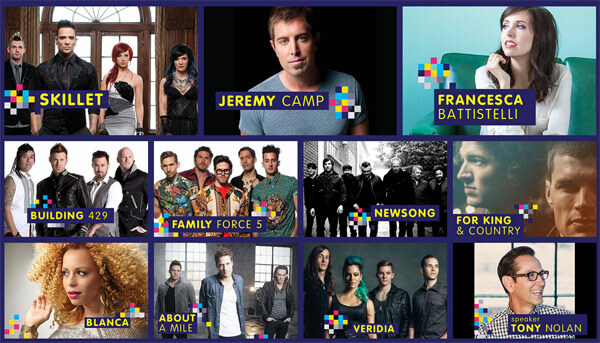 From Francesca to Skillet to Everfound and Veridia, the artists on this year's tour offer a wide range of entertainment for every family member and every generation. "I am thrilled for everyone to experience this show," concludes Riley. "From the first pre-Jam artist to the last explosive Skillet song, it will be a diverse and powerful night of music." For information, venues and ticket information, visit www.jamtour.com. NewSong's Winter Jam Tour Spectacular has been the #1 tour in the world (first quarter) for four consecutive years. In 2015, the blockbuster tour will celebrate its 20th anniversary with 47 dates headlined by GRAMMY®-nominated, platinum-selling rockers Skillet. Since creating Winter Jam in 1995, GRAMMY®-nominated NewSong hosts and continues to oversee the exponential growth of this groundbreaking tour. Promoted by Premier Productions and presented by Holt International, the Winter Jam Tour Spectacular features Christian music's best and brightest artists and provides a powerful platform for the Gospel message across the country. For further information and a complete list of tour dates, visit www.jamtour.com. A leader in the music industry, Word Entertainment, a Warner/Curb company, is a unique, comprehensive entertainment company comprised of multi-faceted artist service departments including publishing, merchandising, booking, and online initiatives. Word Entertainment represents some of the top names and brands in music, including Meredith Andrews, Chris August, BarlowGirl, Francesca Battistelli, Big Daddy Weave, Jason Castro, Patrick Ryan Clark, Group 1 Crew, for King and Country, Everfound, Dara Maclean, Point Of Grace and Sidewalk Prophets and is home to 25 Entertainment, Word Distribution (representing Curb Records and Big Idea/VeggieTales among others), Word Print, Word Music Publishing and Word Label Group's Word Records and Fervent Records. For more info on About A Mile visit the JFH Artists Database. For more info on VERIDIA visit the JFH Artists Database.